Mohamed Salah stated that he is suffering from "pressure" due to being the best Egyptian, African and Arabian player - according to his words - also, claiming that he "reached a position that nobody has ever reached". Salah's statement was not well-received by many, several tweets and Facebook posts were charged with negative criticism towards the Egyptian winger. Mohamed Salah has failed to achieve any major title with Liverpool - who is having a drought in the trophy room anyway - after finishing 4th behind Manchester City, Manchester United, and Tottenham Hotspur FC in the Premier League. Liverpool couldn't win the UEFA Champions League finals after the terrible performance of Loris Karius in goalkeeping and Salah's injury caused by Sergio Ramos duel. Samuel Eto'o, George Weah, and Yaya Toure are considered the best football players in Africa's history, no player yet is to break their records on the individual-level or team honours. Salah's attack didn't come from any fans, but it came first from the Egyptian fans themselves who attacked him after such statements. Most of the tweets we could find about the issue doesn't miss Eto'o's name, who is considered as Barcelona's legend. Barcelona's supporters in Egypt are close to 20 million fans, thus Salah's statement must have triggered these fans to start attacking him on social media. Translation: "Rabeh Majar reached a better position, but from an African player point, I won't talk about Eto'o or Drogba. Salah, George Weah was the best in the world when you were learning how to walk." Translation: "That was a trash statement from you, Salah. You have the confidence or Cristiano and Messi, but I swear to Allah that you achieved nothing. You are like everybody, you don't even have a title." Salah was criticised earlier for his lack of creativity in big games against the top six in the Premier League and in the UEFA Champions League's important games against Bayern Munich and Paris Saint-Germain. Egypt's international hasn't scored a goal in his last four matches in the Premier League against Burnley FC, Everton, Manchester United, and Watford FC. Salah has travelled with Liverpool to face Bayern Munich tomorrow in the Champions League round of 16. 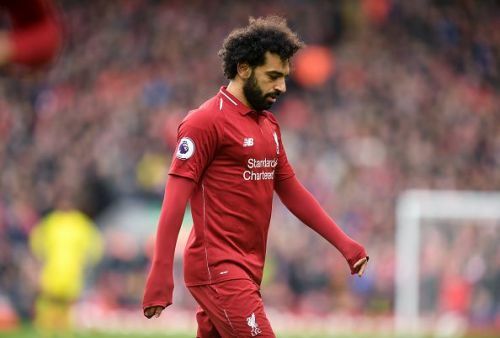 Premier League 2018/19: What's wrong with Mohamed Salah?